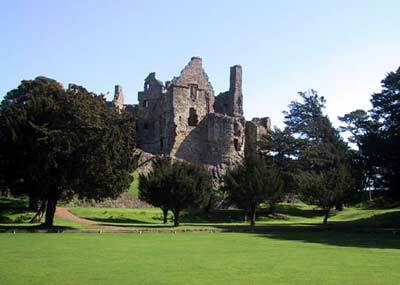 Dirleton Castle's first owners were the de Vaux family, Anglo-Normans who came to Scotland in the reign of David I (1124-53). 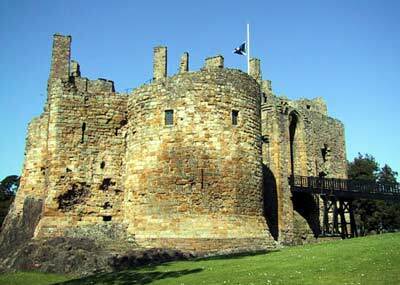 The castle suffered greatly during the Wars of Independence with England in the early 14th century, and was occupied by the English from 1298 to 1311. After its recapture by the Scots, Robert the Bruce ordered its partial demolition. 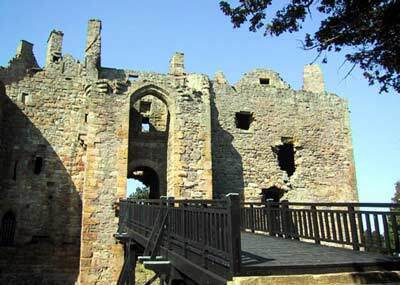 The Halyburtons acquired Dirleton by 1350 through marriage with the de Vaux heiress, and lived here for about a century and a half. They were prominent in public life. One married into the Stewart family, another became Lord High Treasurer to James II, and a third rose to become the first Lord Halyburton of Dirleton. The family rebuilt the De Vaux castle damaged during the Wars with England. 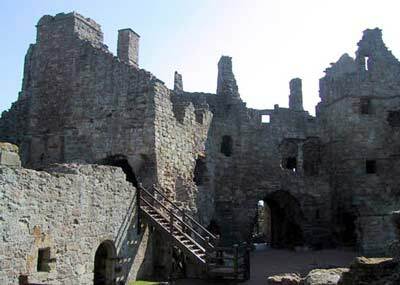 In 1515 the castle passed to the infamous Ruthvens. Patrick Ruthven was an enemy of Mary, Queen of Scots and one of those involved in the murder of her Secretary, David Riccio, in 1566. His son William was created Earl of Gowrie in 1581, and masterminded the notorious "Raid of Ruthven" in 1582 when he tried to gain control of Mary's son, King James VI, by snatching him and holding him in the family's other castle of Huntingtower. 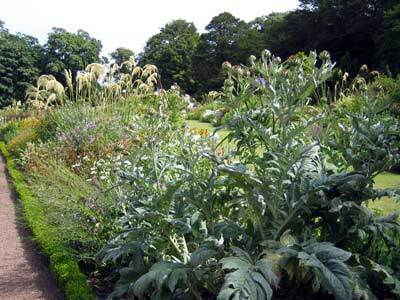 He also further improved the accommodation within Dirleton Castle and laid out the grounds as a formal pleasure garden. But after Cromwell's troops attacked and took the castle in 1650, the castle fell into disuse and in 1663 the new owner, Sir John Nisbet, abandoned this ancient fortress in favour of a more comfortable house at Archerfield, a short distance away. 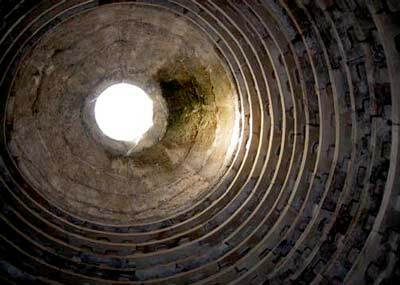 Like its counterpart Tantallon Castle a bit further on, Dirleton Castle boasts a fine example of a dovecot. This one was probably built in the late 1500s. 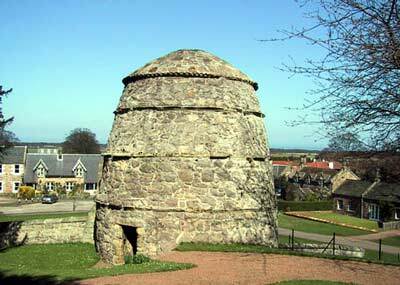 Dovecots provided the laird with an additional source of meat, and shooting his pigeons was a criminal offence punishable by forty days in prison, or the loss of one's right hand for a re-offender. The image on the right shows the inside of the dovecot with its rows of stone nesting boxes which would have housed pairs of breeding birds. The birds would fly in and out through the opening in the roof. A medieval lord was responsible for law and order in his barony, and exercised the right of "pit and gallows". Imprisonment was not a form of punishment, and prisons were designed simply to confine suspected villains until they could be brought to trial. However, due regard was paid to rank and station. 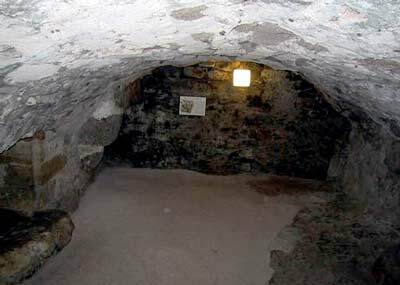 The higher strata of society would be incarcerated in the prison, which contained a reasonably-sized fireplace, windows and a latrine at the top of the stairs. 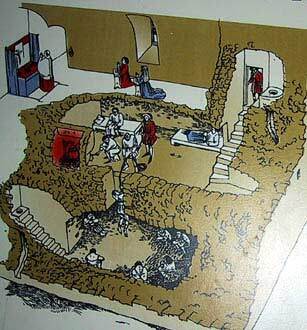 The common people were relegated to the "pit" beneath, a sinister dark hole with a smaller latrine and poor ventilation. These vaults built for the Halyburtons in the late 14th century were used to store the rent in kind paid by their tenants. 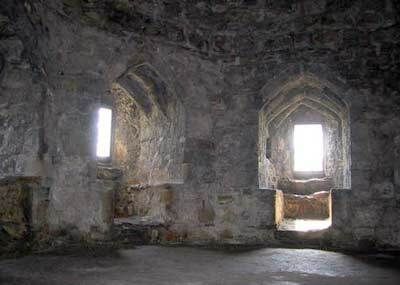 Salted meat and game, meal, butter and cheese, eggs, wine and ale were kept ready for consumption in the great hall above. 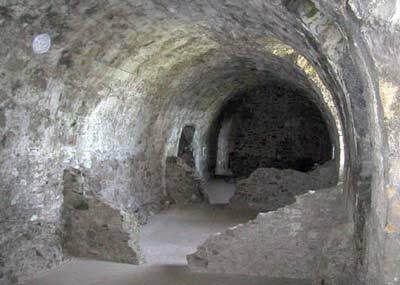 Each walled compartment was entered by a door from the courtyard and one end of the vaults was turned into a bakehouse later. The great stone castle of the de Vaux consisted of several round towers joined by a mighty enclosing wall, and further defended by a wide and deep ditch. Each of the towers held private chambers for the Lord, his family, household and guests. Out in the courtyard was an ancillary accommodation, including a great hall, kitchens, brewhouses, bakehouses, stables and so on. The image on the right shows the de Vaux's Hall, the main room in his private lodging. The kitchen was probably on the floor below. Next door was his private bedchamber and latrine. Further private chambers were on the floor above.